Windhoek is both the capital and the largest city of Namibia. It is located at the center of the country in the area of Khomas Highland plateau. It boasts as Namibia’s major economic hub as nearly all national enterprises, educational institutions, government agencies and cultural bodies are headquartered here. Windhoek hosts a population of about 322, 500 people from a survey conducted in 2012. It, however, continues to grow as it is the major preference for all Namibians. Windhoek is estimated to have share of 96 percent in utilities, 94 percent in communication and transport, and 82 percent of the businesses in the country. It also boasts as the major holder of majority employment in the country. While English is the official language, a large population speaks Afrikaans. German is also quite popular with other indigenous languages spoken by only 1 percent of the total population. It hosts both Africans and whites. Windhoek features semi-arid climatic conditions due to its location. It experiences very hot days in the summer months and cool nights. The average annual temperature stands at 19.47 °C which is quite high considering its high altitude. June, July, and August are usually the winter months but experience a little to no rainfall. The minimum temperatures for winter range from -5 and 18 °C. Nights are very cold. However, days are warm to hot with a maximum temperature of 20 °C and 31°C in July to January respectively. 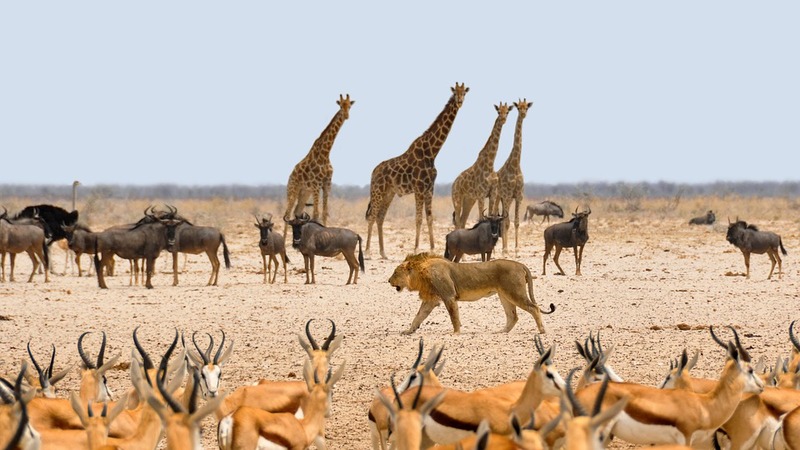 Windhoek is the major start of most of the safaris undertaken throughout Namibia. It hosts various tourist attractions such as the Alte Feste (Old Fortress) which currently houses the National Museum. This building was built back in 1980. The Christuskirche, which is a Lutheran church, is also quite a magnificent site. It was built in the 1910 and was designed in the gothic revival style with Art Nouveau elements. It is located in Windhoek’s historic center next to Parliament Gardens. Other old structures include the Curt Von Francois Monument located in front of the municipality building. It was built in 1965 and seeks to commemorate the second foundation of the town by Von Francois. Others include the statue of Reiterdenkmal (Equestrian Monument) located in the yard of the Alte Feste, Turnhalle- a neo-classist building inaugurated in 1909, and Tintepalast (Ink Palace) located within Parliament Gardens. You can also visit the Windhoek Railway Station, Windhoek Public Library built in 1925, the Supreme Court of Namibia built between 1994 & 1996, St. Marien Kathedrale, the National Library of Namibia, and the Heroes’ Acre.